You can never have too much support from your family and Diana Ross shows us just how it's done. No matter how old you get, there is always something incredibly sweet and overwhelmingly satisfying about having the support of your parents. That’s a feeling that actress Tracee Ellis Ross knows all too well, as her superstar mother Diana Ross just showed her love for the Blackish star in the most extravagant and Diana way ever. When the 2016 Emmy nominations were announced a few months ago many were happily surprised to hear Tracee Ellis Ross’ name called as a nominee for Lead Actress in a Comedy Series for her role as matriarch “Bow” on the hit ABC series Blackish. After being shut out last year, it’s great to have Ross acknowledged for her comedic skills and chemistry with co-star Anthony Anderson. However when your mother is the original diva of all divas, she must celebrate your accomplishment in grand fashion. 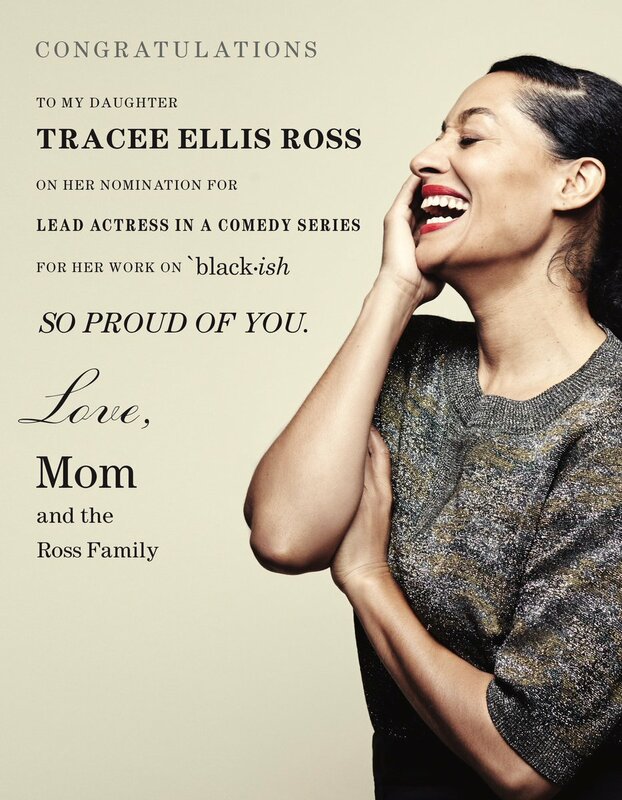 That’s exactly what Diana Ross did when she decided to take out a full page ad of congratulations to celebrate her daughter Tracee’s Emmy nomination. For Harriet has all the details of Diana’s fabulous display of support for her daughter, as well as why her win could be historic. Tracee Ellis Ross received her first nomination for her portrayal of Rainbow Johnson in “Black-ish” this year. Fans of Tracee since “Girlfriends” are overjoyed to see her finally getting her due. But there’s no way we could be as proud of her as her mother, Diana Ross. The elder Ross has had an illustrious career of her own, but she’s always put being a devoted mother first. Tracee shared that her mom took out a full page ad in the entertainment industry trade magazine, The Hollywood Reporter. 43-year-old Tracee is the first Black woman to be nominated in the Outstanding Lead Actress in a Comedy category since Phylicia Rashad in 1986 for “The Cosby Show.” If she were to win, she would be the first black woman to do so. We will definitely be rooting for Tracee at this year’s Emmy awards ceremony, which takes place live on September 18 at 8pm. Congrats again!